We have been working with and testing vacuums for over 10 years. During that time we’ve looked at many different brands (Shark, Miele, Dyson, Bissell, Hoover, etc) but we've probably done more detailed reviews of Shark vacuums than any other brand. We have noticed during this time that some models are better-suited for bare/smooth flooring than others. A few years ago Shark introduced a new technology to their cleaner heads - DuoClean Technology - and this took their hardwood floors cleaning to another level. Essentially DuoClean Technology means there are 2 brushrolls in the cleaner head - 1 stiff bristled brushroll in the center and 1 soft roller brushroll at the front. See the image below. - Directly engage hard floors. 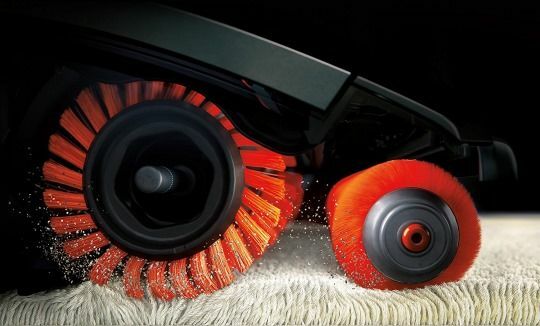 The soft brushroll removes stuck-on dust. - Pull in high piles and large debris. No front wall on the cleaner head helps the soft brushroll pull in both small and large particles. In the follow video we test the Shark APEX and see that it makes short work of debris (hair, dust, lentils, fruit loops, etc.) on a hard surface. In the video below we also investigate large debris pickup on a hard surface (comparing it to a Dyson vacuum). Another feature of DuoClean Technology is the ability to grab debris right up to the front of the cleaner head because of the rotating soft roller. This is really nice as many traditional cleaner heads will not do this. Also, please note that Shark stick vacs with DuoClean have 2 settings: Hard-Floor and Carpet. The Shark upright vacuums have 3 settings: Hard-Floor, Low Pile Carpet, Thick Carpet. The brushrolls both spin in ALL settings. They cannot be turned off. The settings simply adjust the speed of the brushrolls (and in some cases they also ratchet open a suction release valve). - Can’t turn brushrolls off. May not be an issue for most folks but if you have very delicate hardwood flooring or expensive area rugs it could be. We have not had a problem with any of our DuoClean machines and we have yet to hear from anyone telling us about hardwood floor scraping are scuffing. We have heard from some folks however indicating they did not like to run this on their expensive/delicate area rugs (they want brushrolls off). - On carpet can sometimes pull the vacuum forward. Some people like this and some people do not. The vacuum can sometimes feel self-propelled. This is not noticeable on hardwood floors however. - On carpet can make the vacuum difficult to pull back. This is the result of the two brushrolls pulling the unit forward. Again, this is not noticeable on hardwood floors. Shark vacuums with DuoClean Technology perform similary on hardwood floors, although the larger vacuums with more suction ultimately do a slightly better job. Given this, the best Shark vacuum for hardwood floors may best be determinined by considering you and your home. Are you comfortable with a large DuoClean vacuum or would you prefer something more compact/lightweight? Are you set on a cordless vacuum (these are becoming more and more popular)? What size cleaning area do you have? To make this as easy as possible we’ve organized the vacuums based on your cleaning area size. Vacuum weight, size, features are considered in the discussion. The Shark APEX was rated 90/100 on Vacuum Cleaner Advisor and we like that the unit has DuoClean Technology, a HEPA filter, and a sealed system which ensures that all the air entering the vacuum gets filtered before it is exhausted from the machine. The APEX is also very quiet for an upright vacuum and our noise level tests have shown it to be less noisy than almost all of our other vacuums (including other Shark uprights). Our cleaning tests have also shown that the APEX is great at pulling up large and small debris on both carpet and hard flooring. Another great feature on the APEX is its overall versatility. This vacuum is good for floor cleaning and for above-the-floor cleaning (using hose, wand and tools). It also comes with the popular Powered-Lift-Away mode which provides the ability to walk with the dust-canister/motor assembly in one hand and tools/hose/wand in the other. You are only limited by the length of the power cord here and this setup allows you into places the upright can’t go. The APEX AX952 even includes a motorized pet hair tool which fits on-board the vacuum and is great for stairs and upholstery. If you are interested in the Shark APEX you may want to check out our very detailed Shark APEX AX952 review in which we run the machine through many tests. We also provide – in the review – a host of videos so you can see the machine operating and view the vacuum features. You can also check out owner comments on Amazon. The Shark Rotator with DuoClean is a compact upright so it is lighter and smaller than the APEX models described above. It is a good fit for those who want a slightly lighter upright and have a medium sized area to vacuum. This series of vacuums has good filtration and is designed for those with asthma or allergies. Consider models NV800, NV800W, NV801, NV803 (please note that the NV801 and the NV803 are the same machine, they are just sold at different retail outlets). The Shark Rotator with DuoClean has a HEPA filter and also what Shark calls Anti-Allergen Complete Seal Technology. This combination ensures that the air entering the vacuum is filtered to a very high level before being released back into the room. These vacuums weigh, on average, about 1.5 lbs less than the full size APEX vacuums. As a result they are a little smaller and more compact. This means the dust canister is also smaller which results in more frequent emptying. It’s not a big deal with a medium sized home but with a larger home it could be in issue. The cleaner head is also smaller than that on the full-size APEX which means more passes of the vacuum to clean a given area. But it’s great for smaller areas – very manueverable and gets into tight places. The power cord length is not compromised and is a full 30 feet which provides a good cleaning reach. And the Rotator comes with the very popular Lift Away feature which allows you to detach the dust-canister/motor assembly and carry it while using the tools/hose/wand with the other hand. A Pet Power Brush is provided with the NV800/NV801/NV803 and it works fairly well. However this tool is not motorized (like the one that comes with the APEX AX952). Our tests show that the motorized tool requires less maintenance to keep running optimally. We’ve written a very detailed Shark Rotator NV801 review and you may want to check it out should you be interested in this vacuum. We’ve done several cleaning tests and also include videos in the review highlighting the vacuums features and performance. We like that the NV801 can often be found for about $100USD less than our #2 medium-sized area choice below (the APEX Compact). You can check out NV801 owner comments on Amazon. There is a smaller version of the APEX known as the AX912. This is compact like the Shark Rotator with DuoClean and it weighs 1.5 lbs less than the other APEX vacuums (so it is close to the same weight as the Shark Rotator with DuoClean). These vacuums also have good filtration and are a good fit for those with asthma or allergies. Also, the AX912 has something called Active Glide Technology while the NV801 does not – although we have not really noticed any difference in maneuverability between machines with this technology and those without. Finally, the AX912 has “Advanced Anti-Allergen Complete Sealed Technology” while the NV801 only has “Anti-Allergen Complete Sealed Technology”. According to Shark “Advanced Anti-Allergen Complete Sealed Technology” emits 10x fewer particles than HEPA standards require. Although this high level of filtration may not be entirely necessary for most folks. This machine is not as popular as the full size APEX units. You can see it on Amazon if you want. At about 9 lbs the Rocket is a little heftier than some other stick vacs so some folks classify it somewhere in-between and upright and a stick vacuum. Like all Shark vacuums this unit is bagless. It is also corded and it sports a respectably long power cord allowing for a good cleaning reach. This is a two-in-one vacuum as it converts easily into a handheld vacuum, and tools can be placed directly on the end of the handheld unit. It does not have a HEPA filter but the filters it does have are washable. Cleaning performance on both carpet and hard flooring is good. However this vacuum will not stand upright on its own – something several owners have complained about. The vacuum is manueverable and the swivel steering makes it easy to change nozzle direction at the twist of the wrist. The vacuum is also capable of laying almost completely flat which helps tremendously when trying to get under low furniture. Of course, like all DuoClean machines, this vacuum is also designed for carpet. We’ve done a very detailed Shark Rocket Complete HV382 review and you may want to check it out if this vacuum is of interest. You can also check out owner comments on Amazon. The Shark IONFlex is similar to the Shark Rocket above except it is cordless. It is a good choice for people with a small cleaning area who don’t want something too heavy and don’t like to be tethered by a cord. However, like the Shark Rocket this vacuum doesn’t have robust filtration. Consider any of the IF200 series. The IONFlex rated 78 out of 100 on Vacuum Cleaner Advisor and this is a lower figure than all other Sharks vacuums in this article. Folks who don’t like this cordless vacuum have pointed to its weight, its inability to stand on its own, its small dust canister, its battery life, the tendency for the vacuum to pull itself forward, and its cost. On the flip side the IONFlex is popular for its ability to clean both carpet and bare floors, its intuitive vacuum controls, and its powerful suction (for a cordless). Much like many cordless vacuums this unit’s rating depends on who you talk to – people have many different expectations from a cordless. We have the Shark IONFlex 2X IF252. The 2X in the model number refers to the fact that the vacuum comes with 2 batteries. This is an excellent feature and one we wish we saw on more cordless machines. When one battery is being used the other is charging, and they are designed to swap out almost effortlessly. The Dyson sticks vacs could learn from this feature. The IONFlex also comes with a very unique feature called MultiFLEX Technology. This allows the wand to bend in the middle a full 180 degrees. We don’t find this to be particularly useful but we have spoken with some other owners who really like it. We published a lengthy review of the Shark IONFlex recently and if you are interested in this vacuum you will want to take a look. You can also check out IONFlex owner comments on Amazon if you wish. Looking for a Different Shark Vacuum? 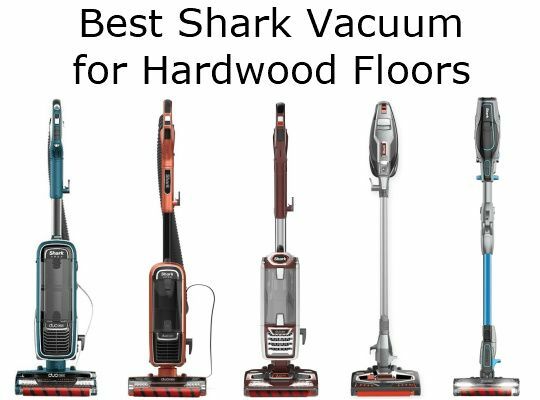 We recently published an article that highlights the best Shark Pet Vacuum. There are a few different models highlighted in this article so folks interested in Shark machines may find it interesting. We've also written a comprehensive Shark vs Dyson article in which we compare the two brands. In addition, we pit the top machines from each company against one another. The bristle brush on the Shark powered lift away feels too stiff to use on a high shine engineered wood floor since the brush can not be retracted. I bought one, but have not opened it yet. I’m worried about it scratching my floors. I would appreciate some feedback.